Who knew in 1971 that the Gold Rusher would start a race to the top of the coaster wars that would continue for decades? 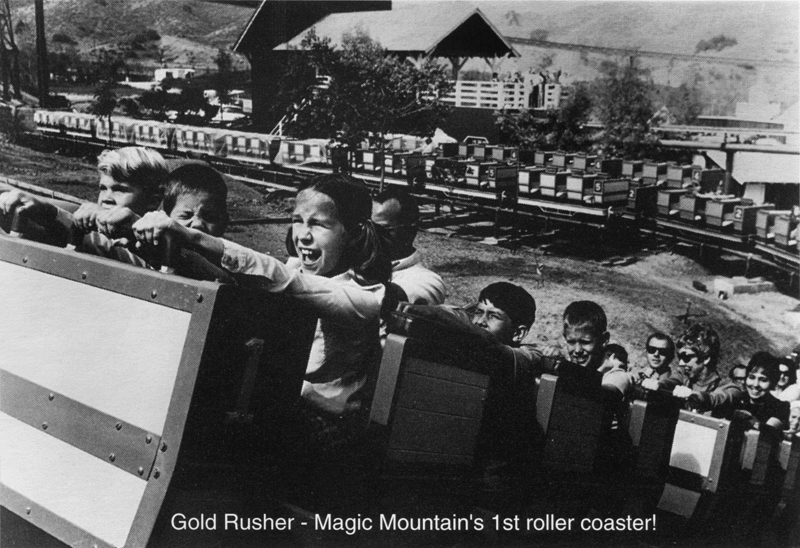 Magic Mountain's first roller coaster navigated the mountainous terrain at a breathtaking 35 mph. It was built by Arrow Dynamics, which had grown from a little machine shop in Menlo Park, Calif., in 1946, into a major theme-park attraction fabricator after Walt Disney discovered it in 1953. So impresed was Mr. Disney that he bought 33 percent of the company. Arrow Dynamics was responsible for some early Disneyland favorites such as Mr. Toad's Wild Ride and Snow White's Scary Adventures, and it built its first-ever roller coaster for the happiest place on earth — the Matterhorn Bobsleds. It would be many years before Arrow Dynamics built another coaster for Magic Mountain, and when it did, it was a different company. Its founders retired and sold the business in 1972; Arrow Dynamics was restructured several times, moved to Utah, and was no longer at the top of the industry when Six Flags hired it in 1988 to build Ninja, followed quickly by Viper in 1990 and X2 in 2002. In that year, Arrow Dynamics went bankrupt for the last time and was gobbled up by rival coaster maker S&S Power.